Play Black Knight Slot Online with 500 Free Spins! Black Knight is a 5 reels, 30 paylines online slot game by WMS Gaming. 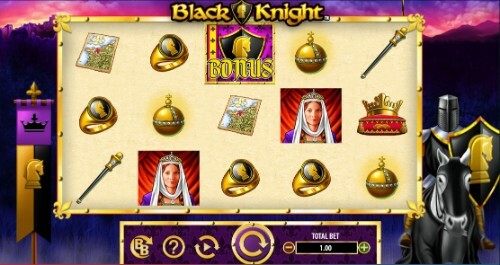 Black Knight has Wild, Scatter Symbols, Expanding Symbols, and Free Spins features and an RTP of 94.9%. Rose Slots is the best place to play Black Knight, where it’s one of over 500 leading UK online slots we host including Fluffy Favourites, Starburst, Rainbow Riches and Great Rhino. Medieval times probably weren't a great period of history to live through. Living conditions for peasants were squalid, the power of a King or Queen was absolute, if you wanted to own a property or a piece of land you probably had to fight someone for it and worst of all, nobody had invented the internet yet! Imagine having to go through all that misery and not even being able to play a good online slot at the end of the day to relax. Fortunately, things have evolved since then, so we're now at the point where Rose Slots is here to entertain you, and the medieval era is just a theme you might encounter when playing online slots. Online slots such as Black Knight, for example. WMS Gaming - a subdivision of Scientific Gaming - have a hard-won reputation for making entertaining online slot games with a traditional feel. This is one of their older products, having hit the internet for the first time in 2011, but well-designed traditional slots don’t age. Black Knight is as playable and enjoyable now as it was when it was brand new. Visually, Black Knight plays heavily into its theme. Night has fallen on the dark land the slot is set in, with the silhouette of a castle looming large against the bruised, purple skies. The gold-framed reels appear to be made of parchment (a predecessor to the kind of paper that’s in your printer, and on them we have a set of symbols that are all derived from the Royal Court of the time. We have no bearing on who might have been sitting on the throne during this period of history, so just pick your favorite medieval King or Queen of England and go with it. The lower-value symbols here are a crown, a golden ring, a map which covers parts of England and France, a golden orb, and an equally golden scepter. Above them are the King and Queen themselves, along with the court jester. Oddly, the jester is worth more than the crown. In historical reality, the jester was a throwaway role who would likely be executed if they failed to make the monarch laugh! The wild symbol in Black Knight is the knight himself, looking majestic on horseback. There’s also a scatter symbol which is represented by the knight statue from a game of chess. The scatter and wild in this slot behave a little differently than the manner you may be accustomed to from playing other online slot games, and to explain what we mean by that we’ll have to talk about the bonus features. There are many developers out there in the world of online slot games which can trace their lineage back into the time before online slots were possible Bally and Barcrest are just two such examples, but WMS Gaming has both of them beaten when it comes to longevity. WMS Gaming is the legacy of the Williams Manufacturing Company, opened by Harry Williams in 1943 - a time when the Second World War was still raging! Williams must have decided that the nation needed some entertainment, because he created the ‘tilt' feature which revolutionized the way pinball machines worked. Williams pinball machines were everywhere for the next two decades. As home computing began to become popular during the 1980s, the now-renamed WMS tried its hand at making video games but also used their skills as pinball machine builders to start developing physical slot machines. They excelled at it and stuck with the physical side of casino operations even when everyone else decided to go online. WMS held out from entry to the UK online slots market until 2010, when they finally decided that physical slot machines were no longer a viable business model on their own. A year later they’d found themselves a huge business partner in Scientific Gaming, who decided to buy them outright and merge them into their own operations. Ironically, they’ve joined their fellow British gaming legends Bally and Barcrest under the Scientific Gaming umbrella! Other top slot games from WMS you may try out Raging Rhino slot game and Spartacus online slot. There’s only one real bonus feature in Black Knight, although it combines with Expanding Wilds to make the feature more exciting. You might have noticed that we didn’t tell you which symbols the wild symbol substitutes for when we described it, which we normally do here at Rose Slots. There’s a reason for that - it substitutes for all other symbols to create paying lines, but it can also trigger the bonus feature too. In truth, the bonus feature is just a Free Spins round with some interesting quirks. If you’ve played plenty of online slots, you’re probably used to the scatter symbol triggering a bonus feature, whether it be free spins or something else. That works here, too, but you don’t necessarily need all three scatter symbols to do it. The scatters can appear anywhere on the reels. The wilds can only appear on the second, third and fourth reel. You need at least three scatters to kick off your free spins feature, but the wild can substitute for the scatter. That means if you have a scatter on the first and second reel, and a wild on the fourth, the bonus round will be triggered. You get seven free spins for three wilds or scatters, but more are available for more symbols. During free spins, any wild that appears will expand to cover the whole reel it lands on. Not only that, but it freezes in place for however many free spins you have in place. You could get two, three or even more completely wild reels during your free spins - and you probably don’t need us to tell you that you’ll see plenty of winnings as a result of that. Black Knight might look a little basic, but a combination of the atmospheric backing music and the execution of the free spins feature make it a memorable and enjoyable slot game.